When machine members fastened together with Riveted joints, cotter joints, knuckle joints etc. There will be a compressive stress produced at the surface of contact between the two machine members. This stress can be called as the Bearing Stress. Let’s see how a bolt can experience the bearing failure. Bearing stress can also be said as Crushing Stress. Mathematically Bearing stress can be defined as the compressive load divided Characteristic area perpendicular to it. Now let’s see how it will be produced in a riveted joint. Consider, a Riveted joint subjected to load P. The diameter of the riveted joint is d where thickness of the plate is t.
The terminology of Bearing Pressure and Bearing stress might be different. When we talking about the design of Journal for Bearings, Crank Pins for the crankshaft, Gudgeon pin for connecting rod and piston Clutch Linking etc. In this scenario, we will call the compressive stress between the two contacted surfaces as the Bearing Pressure. When we talking about the Riveted joints, cotter joints, knuckle joints etc, We will call the compressive stress between the two contacted surfaces of the parts as Bearing Stress. Now let’s get into the Bearing Failure topic. Bearing failure is the failure which occurs in the plate when the applied load crosses the elastic limit. This Bearing failure will happen in Plates only(Not in the rivets). 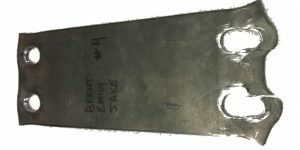 When a failure occurs in the rivets or bolts then it is called as the Shear failure. This below one is bearing failure occurred sample. Shear Failure will be like the followings Gif image. This what shear failure will look like. Now we have a clear idea of the bearing failure and Shear failure. Bearing Failure and the shear failure both occurred in Riveted joints, cotter joints, knuckle joints etc. 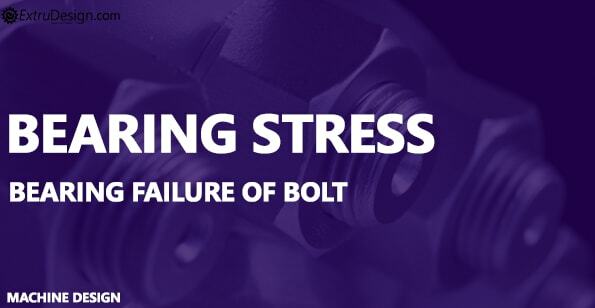 But the difference between the Bearing failure and the Shear failure is that shear failure will occur particularly in rivets or bolts(Fasteners), where Bearing failure will occur in the plates or the parts joined together.